The justices refused to hear an appeal by Phyllis Young, who runs the three-room Aloha Bed & Breakfast in Honolulu, of a lower court's ruling that she violated a Hawaii anti-discrimination law by refusing to rent a room to Diane Cervilli and Taeko Bufford in 2007. A state court ruled that Young ran afoul of Hawaii's public accommodation law, which among other things bars discrimination on the basis of sexual orientation. Litigation will now continue to determine what penalty Young might face. 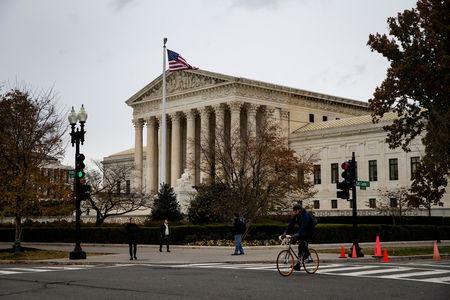 The Supreme Court's action came nine months after it sided on very narrow grounds with a Colorado baker who refused to make a wedding cake for two men, citing his Christian beliefs. The justices could decide as soon as next week whether to take up a strikingly similar case from Oregon in which a bakery refused to make a wedding cake for a lesbian couple for religious reasons. Young, who is Catholic, said her decision to turn away Cervilli and Bufford was protected by her right to free exercise of religion under the U.S. Constitution's First Amendment. Young also argued that Hawaii did not give her fair notice that her business was covered by the public accommodation law. "The freedom of religion does not give businesses a right to violate non-discrimination laws," said Peter Renn, a lawyer with gay rights group Lambda Legal who represents Cervilli and Bufford, who are no longer a couple. "The Supreme Court declined to consider carving out an exception from this basic principle when a business discriminates based on the sexual orientation of its customers." James Hochberg, Young's lawyer, said his client was merely trying to work in accordance with her religious beliefs. "The government went after Mrs. Young's constitutionally protected freedom simply for adhering to her faith on her own property. This kind of governmental coercion should disturb every freedom-loving American no matter where you stand on marriage," Hochberg added. At Young's bed and breakfast, "the only romantic partners allowed to share a bedroom are a married man and woman," her lawyers said in court papers. The Supreme Court in that case also did not address important claims including whether baking a cake is a kind of expressive act protected by the First Amendment's free speech guarantee, a question not raised in the Hawaii case. The baker ruling was written by Justice Anthony Kennedy, a champion of gay rights and author of the 2015 ruling legalizing gay marriage. Kennedy retired last year and was replaced by Brett Kavanaugh, President Donald Trump's second appointee to the court. During his Senate confirmation hearings last September, Kavanaugh declined to discuss his views on gay marriage. He was not involved in any gay rights cases in 12 years as an federal appeals court judge. Of the 50 states, 21 including Hawaii, Colorado and Oregon have anti-discrimination laws protecting gay people. In the Hawaii case, Cervilli and Bufford sued in 2011 and were joined in the litigation by the state's civil rights commission.